Pavlova is believed to have been created in the 1920s to honour the Russian ballerina Ánna Pávlova when she toured Australia and New Zealand, with its original creation contested by both countries. This recipe caught my eye on a Saturday morning television programme last Summer: for some reason, until then, Irish cook Rachel Allen had passed me by. I think it was the combination of chewy Pavlova style meringue combined with coconut, as well as the cherry and creamy filling, laced with rose water, that attracted my attention. I made a mental note that it was the sort of recipe that my mother would like and a few months later produced it for her birthday meal, where it was extremely well received. The meringue was crunchy on the outside and satisfyingly gooey on the inside, a heavenly flavour combination with a delicate perfume – delicious! This is a wonderful recipe for a special occasion as the meringue and the filling can be made separately in advance, with the dessert being assembled an hour or two before serving. I have since watched several Rachel Allen programmes and copies of her books are on my ‘wish list’. I have my eye on some of her other recipes, which may well appear on these pages in the future. I think the programme was called Rachel’s Favourite Food for Living and certainly there is a book with that name. 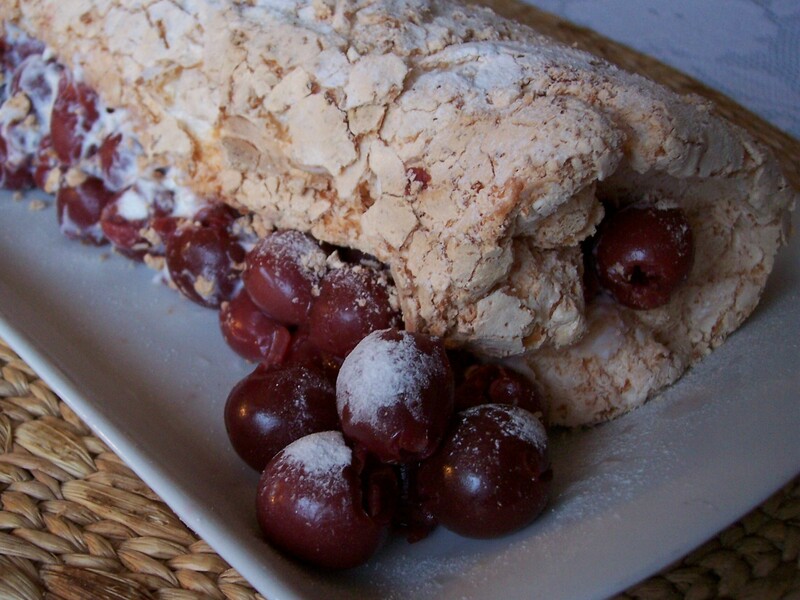 The recipe is available on the Good Food Channel website, called Pavlova Meringue Roulade with Cherries and Rosewater Mascarpone (a bit of a mouthful, I know). I like to use low fat dairy products in an attempt to be a bit more healthy, difficult I know with a rich and luxurious dessert like this one. I had great difficulty tracking down low fat Mascarpone (30% fat), which I had never used before. I eventually found some and used it, but decided that the recipe would be just as good, in fact better, using low fat crème fraîche (or fromage frais). I substituted a bottle of cherries in syrup (Harvin brand from Lidl supermarket), which was drained and the cherries then spread out on kitchen paper to soak up dampness before being checked over for stones (pits). (Reserve the cherry juice and use it in place of some or all of the water when setting a jelly.) The bottled cherries was a good substitute for the fresh cherries used in the original, which were anyway well out of season. The jar yielded slightly more cherries than the quantity below so I was able to serve a few extra on the side. Rachel Allen has a second similar recipe on the Good Food Channel site for a Meringue Pavlova with a Raspberry Filling, also including coconut in the meringue and flavoured with rosewater, but with a lemon cream filling. The basic pavlova roulade would be delicious with any number of fillings in combination with either plain or flavoured cream and I shall certainly be making versions of this recipe again. 2. Use tin foil to line a Swiss roll tin, leaving a border of 4cm (11/2in) high all round. Fold the sides of the foil up to make a frame, squeezing the corners together to help the sides stand upright. 3. Brush the foil lightly all over with sunflower or vegetable oil. 4. Separate the eggs and whisk the whites in a clean bowl until they form soft peaks. 6. Add the sugar to the egg white mixture. Whisk at full speed for around 4–5 minutes until it forms stiff peaks that hold their shape. 7. Using a large metal spoon, firmly and quickly fold the coconut into the mixture. 8. Spoon the meringue into the prepared tin and smooth carefully into an even layer with a palette knife. 9. Bake in the oven for 20-30 minutes, watching so it does not overcook. It should be light brown in colour and firm to the touch. 10. The meringue should be allowed to cool for a few minutes, before it is turned out by being inverting onto another sheet of foil. The foil on the underside of the meringue should be very carefully removed. Set aside in a dry place and allow to cool completely. 11. If using bottled cherries these should be drained of their juice, checked carefully for stones (pits) as not all are removed during manufacture, and allowed to dry on plates covered with kitchen paper. Fresh cherries should be carefully checked over, washed, halved, their stones removed and set aside in a cool place. 13. Within an hour or two of eating at most, place the meringue layer on a work surface with the longest edge layer nearest you. Spread the mascarpone evenly over the meringue leaving a 4cm/(just less than) 2 inch band along the nearest edge free of cream. 14. Before rolling, scattering over the halved and stoned fresh cherries. 15. Holding the edge of the foil closest to you, carefully roll up the roulade away from you until all the cream and cherries are folded inside. The exterior will crack as it is rolled. Leave the roulade rolled in the foil until serving (it will hold together well in the fridge for a couple of hours maximum). 17. A little pouring cream adds extra luxury. What a divine dessert with the rosewater and coconut making it really unusual – a lovely dish to make for your mother. I might just be trying this one and cherries will soon be in season. Choclette: Thanks! As it was March when I made this I had to make do with bottled cherries, but they were still fine. I have bought some cherries on our market today so perhaps, while they are around, I ought to have another go at this too. That’s such a beautiful pavlova roll. I remember my friend made once for me and it was fabulous. I have always wanted to try one but have not got down to doing it. Thanks for reminding. Thank you Mary – the roll is impossible to make without a bit of cracking, but it really doesn’t matter as it still tastes fine. Strange we should both be posting rolled desserts in the same week!